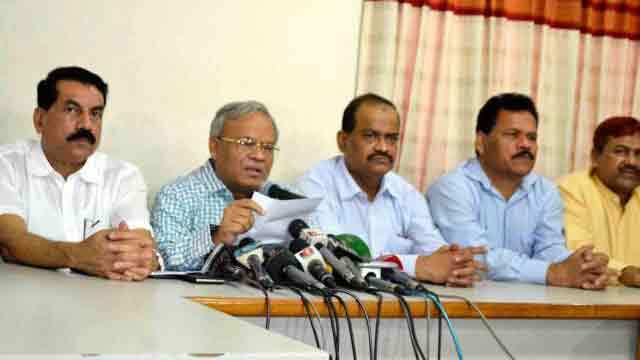 Dhaka, Mar 31 (Just News): BNP on Saturday alleged that a report of the US' Federal Bureau of Investigation (FBI) on Bangladesh Bank’s Tk 800 crore reserve heist has unmasked the government. Speaking at a press briefing at BNP's Nayapaltan central office, party senior joint secretary general Ruhul Kabir Rizvi also claimed that their party's allegation against the government regarding the central bank's reserve heist has now proved correct with the FBI investigation. "The FBI has confirmed that the heist of $81 million from the Bangladesh Bank account at the New York Federal Reserve was state-sponsored one," he said. The BNP leader further said, "The FBI has also said they've reached a close position to publish the names of those involved in the world's biggest reserve heist incident. So, the allegation brought by our party has proved right." He also said it has now become clear to people as to why Finance Minister AMA Muhith did not disclose the investigation report of such a big bank heist incident. Rizvi said the current government could not develop the country as it only plundered public money. "They (govt) have no regret after a so much big theft incident." He said there is a public perception that a very influential man is behind the central bank's reserve heist and the government has no power to take action against him. The BNP leader, however, did not mention where and when the FBI report was published. On February 5, 2016, international cyber hackers stole about $81 million from Bangladesh Bank's treasury account with the New York's US Federal Reserve Bank. Referring to a report of Asian Human Rights Commission on Bangladesh's human rights situation, Rizvi said the real human rights condition is more horrifying here than the report depicted. He said the way their party chairperson Begum Khaleda Zia was put in jail in a 'false' case and her bail stayed at the behest of the government is the extreme violation of human rights.